This update brings long awaited changes, nerfs, buffs and a very belated game feature. But the main focus for this updated are the changes to the turret based hero: Bastion. From the PTR servers, a lot of players have mentioned that these changes make the robot way more aggressive. 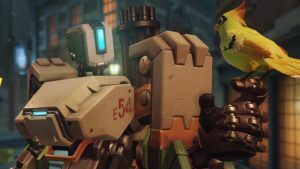 In addition to the Bastion changes, Roadhog is getting a nerf for his one hook one kill combo. D.Va’s defence matrix can now absorb shot point blank and Mercy not being in too much danger when resurrecting. As for gameplay itself there are two major changes. Respawn times have been tweaked, making it so when one team is loosing massively, the othre team gets a increased respawn timer. There is now a server browser which will let players customize and share their own game modes with everyone on the internet.